Snowflame was conceived as a villain by DC writer Steve Englehart for an incredibly short-lived comic series called “The New Guardians”, appearing in just one of the series’ eventual 12 total issues. The New Guardians were a superhero team comprised of some of DC’s more obscure heroes and, according to the first issue, were specifically chosen to be an accurate representation of the various segments of the human race. It was also noted that the ultimate goal of the New Guardians was to pass on their genetically superior genes to the next generation. Supposedly the idea behind the comic was to use lesser known heroes to explore contemporary themes such as drugs and sexuality, but editors found it too risqué and quickly quashed the comic after the 12th issue. As for Snowflame, he appeared in the second issue of New Guardians, being portrayed as a Colombian drug lord who the New Guardians attempt to defeat to quell the flow of drugs from the region. Because subtlety wasn’t exactly the name of the game with this line of comics, the issue is titled, “Jungle Snow”. 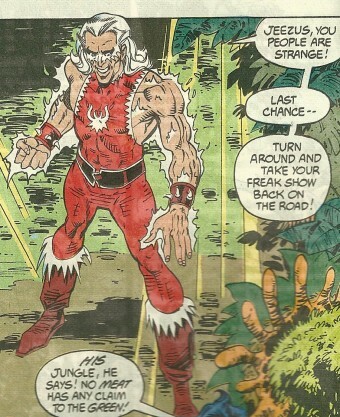 Snowflame then calls for his men, who are also coked out of their minds, to shoot the New Guardians with guns and bury them fully clothed in shallow graves, prompting one of the characters to have a flashback to the aftermath of their fight with The Hemogoblin, which features several pages of surprisingly accurate information about AIDS. Yes, it’s hard to believe they decided to make Batman movies instead of New Guardians. The comic then flashes back to the present and shows that the New Guardians were merely pretending to be dead; how they survived being shot is never elaborated upon. They then track down Snowflame who is found lounging around with several women in bikinis, bragging about how much cocaine he’s going to sell, when they confront him and offer him the chance to surrender. Snowflame grabs a huge handful of cocaine and shoves it directly into his own face. He then commands his bodyguards, who are inexplicably all wearing swimwear and also strung out on cocaine, to attack. During the battle, Floronic Man, who has the power of plants, discovers that he can absorb the cocaine from people’s bodies and uses this knowledge to slowly drain all the cocaine from the bodies of Snowflame’s guards. Snowflame himself is then punched into a shed full of chemicals, which due to his fiery cocaine aura, instantly explodes, presumably killing him. The character is never mentioned again. The late 1980s were a different time, and yikes, almost three decades ago now. DC Comics wasn’t the only ones coming up with oddball superheroes. Marvel Comic’s “Squirrel Girl” was a high school student who could control squirrels and used them to fight villains. She also had a 3-4 foot tail, buck teeth, claws (and retractable knuckle-spikes a-la Wolverine), and lips that tasted like hazelnuts… She wanted desperately to be Iron Man’s sidekick, but he rejected her, even after she saved his life- though he did tell her that when she was older, perhaps she could join the Avengers. 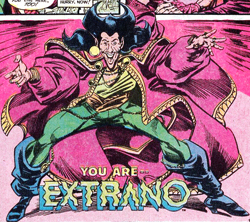 “Zeitgeist” was another “odd” Marvel character. After finding out he had super stomach acid, he naturally decided to use it to fight evil. How did he find out about his super power? After getting drunk and making out with a girl, he fell ill and vomited all over her, burning the poor girl’s face and disfiguring her. (Who hasn’t seen that scenario play out?) His response to the incident- “I sure hope the doctors managed to give her back her pretty face.” The good news is that Zeitgeist now realized he had a super power and began using it for good by vomiting all over the bad guys. His stomach acid was so potent, that it could burn through a 4 inch thick steel plate in half a minute. I’m just guessing with that on her face, the girl did not get her face back. Another bizarre character was “Rainbow Girl”, a DC Comics character who controlled the powers of the emotional spectrum, which would give her extremely unpredictable mood swings. Essentially, Rainbow Girl’s superpower was almost explicitly a raging case of PMS… To fight evil, Rainbow Girl would tap her anger (the color red), hope (blue) and willpower (green). She also had the ability to create a pheromone field that gave her a personality that everyone loved and no one could resist. The Forgotten Supervillain With The Power Of Cocaine!